Singapore seemed a little bit like Hong Kong´s little brother! We stayed at the New 7th Storey Hotel which had a good location and also laundry and Internet facilities there. We headed to Raffles City and to the Long Bar for their famous Singapore Sling. We also visited the 70th floor of the Swissotel to have a drink in the Equinox bar. Which was a little disappointing as it was packed and the service was terrible nothing like the Felix bar in Hong Kong. In the day we did a Duck tour which was 30 minutes on land and 30 minutes on water just showing you the sights of Singapore. 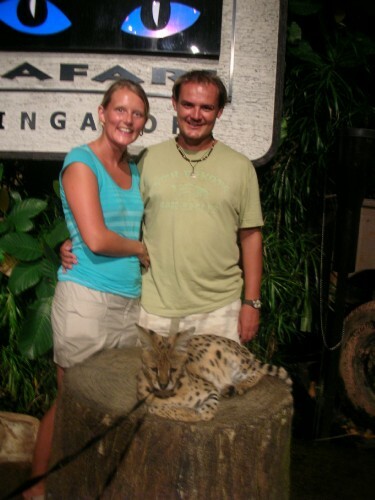 In the evening we went to the Night Safari which was well set up and Wayne held a Python. Afterwards we headed to the Boat Quay which had loads of restaurants and bars. We eat at Sizzling Rock where you can cook your own food on the boiling hot Granite.